I have a long history with True West so it is always nice to get a byline in the magazine. 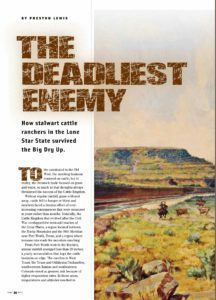 The October issue carries my story “The Deadliest Enemy” on how Texas ranchers survived the two major droughts of the late 19th century. It was a fun story to research and shows how serious droughts were to ranches and the ingenuity that helped ranchers survive. True West was one of the magazines my father subscribed to when I was growing up so I looked forward to every issue of both it and Frontier Times. 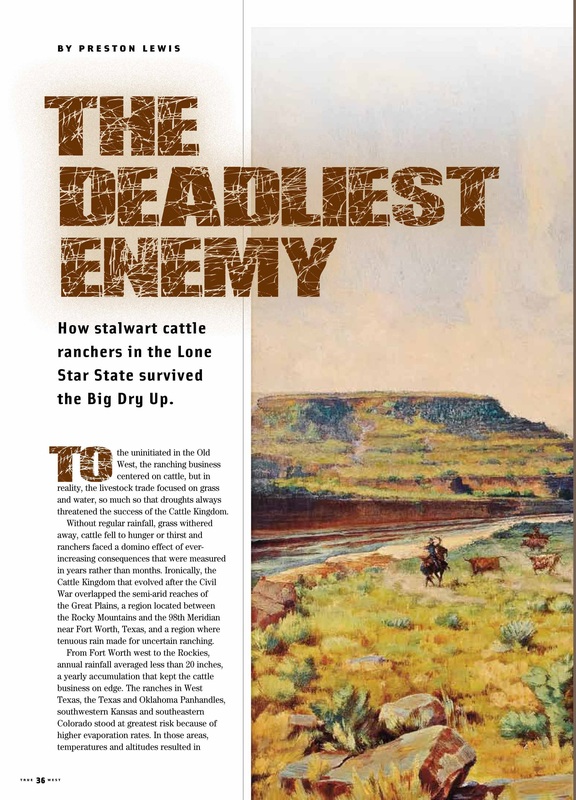 The magazine stories helped foster in me a love of the history and lore of Texas and the West. Little did I realize then that I would one day be published in True West and actually win a few awards for those stories. So, it’s always nice to see my name in True West. When I was a boy reading Dad’s True West, it was printed on a cheap pulp paper and all black and white, except for the cover. Today it is a slick magazine and the layout and art for “The Deadliest Enemy” are the best for any freelance publication I’ve ever had. My next article on the Old West is, oddly enough, a story of cats on the frontier. Titled “The Cat-astrophic West,” the story is scheduled for the December issue of the Journal of the Wild West History Association. Coming in at 7,500 words, it may be the first major work on cats in the Old West as there aren’t a lot of books (I couldn’t find a single one) on the subject. Fortunately, I was able to scour enough old newspapers to uncover plenty of information for a good article and find a few books or journals with passing references to cats. On top of that, I only used about 40 percent of my information so this topic will have other iterations in the future. I’m not a cat person, but I am a fan of good stories. The story of cats in the Old West is filled with the sad, the practical, the unbelievable and the humorous, just the type of tale I like to write.